Free Shipping Included! 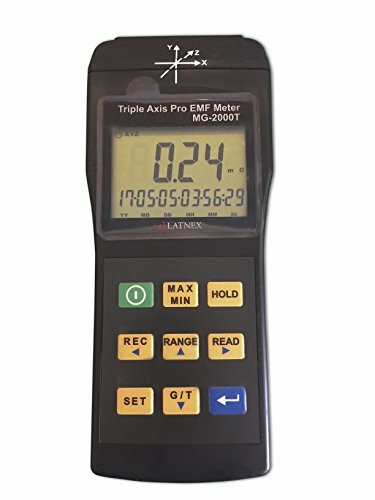 EMI Magnetic field gauss Meter detector MG-2000T Triple Axis Professional use Magnetic Interference from MRI Machines Industrial and Medical Equipment Power Lines Appliances EMF inspections by LATNEX ® at Portable Building Guys. MPN: MG-2000T. Hurry! Limited time offer. Offer valid only while supplies last. Description & Features The MG-2000T Meter is designed to measure electromagnetic fields of extremely low frequency (ELF) in the range of 30 - 2000Hz. The MG-2000T Meter is designed to measure electromagnetic fields of extremely low frequency (ELF) in the range of 30 - 2000Hz. - Auto power off function. For troubleshooting steps, please refer the manufacturer's website. - Overload: LCD display "OL"
- Operating Humidity: < 80% R.H.
- Storage Humidity: < 70% R.H. If you have any questions about this product by LATNEX ®, contact us by completing and submitting the form below. If you are looking for a specif part number, please include it with your message.